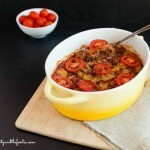 An easy, low carb, grain free casserole with paleo option. 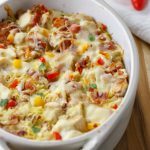 Bacon Burger Cauliflower Rice Casserole is super easy to make, very low in carbs, with a paleo (dairy free) version. Oh my, this was some serious bacon cheeseburger goodness! My son did not know it was cauliflower rice in this dish. He thought it was actual rice. The whole family loved this recipe and fortunately, it was an easy one to make! 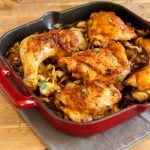 If you have a large cast iron skillet, then you could make this dish all in one pan. I did not have a pan that can go from stove-top to the oven, so I used a casserole dish. I would use a cast iron skillet, but I have a glass stovetop and I fear I would break it or scratch it with a heavy pan. Preheat Oven to 400 F, and grease or oil a 2.5-quart casserole dish. In a food processor or blender, grind cauliflower florets into a rice texture. Set aside. 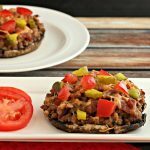 In a large skillet pan over medium-high combine and brown: 1 lb ground beef, ½ tsp garlic powder, ½ tsp paprika, ½ tsp sea salt, ¼ tsp celery seed, and ¼ tsp black pepper. Stir and cook until browned (do not drain beef). Add 8 ounces tomato sauce and 3 cups cauliflower rice to the ground beef skillet. Stir and continue cooking over medium to medium-high heat for 6 minutes. Remove from heat. Sprinkle the top of the casserole with bacon crumbles and optional cheese. Place sliced tomatoes on top, and bake for 20 mins. Remove from oven and serve. 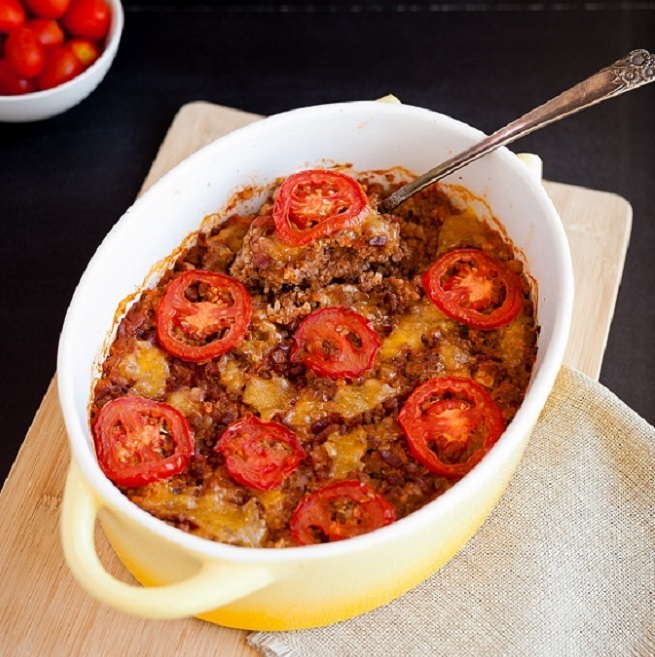 Nutritional Data (includes optional cheese): Total Servings: 9, Serving size: 1 , Cal: 211, Carbs: 4 g, Net Carbs: 2 g, Fiber: 2 g, Fat: 14 g, Protein: 18 g, Sugars: 2 g, Sodium: 437 mg.
Preheat Oven to 400 F, and grease or oil a 2.5 quart casserole dish. 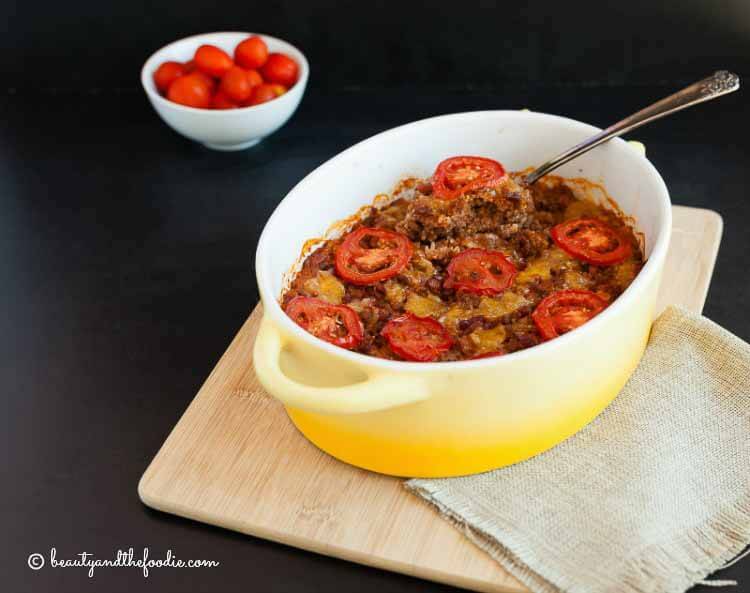 In a large skillet pan over medium high combine and brown: 1 lb ground beef, ½ tsp garlic powder, ½ tsp paprika, ½ tsp sea salt, ¼ tsp celery seed, and ¼ tsp black pepper. Stir and cook until browned (do not drain beef). Add 8 ounces tomato sauce and 3 cups cauliflower rice to the ground beef skillet. Stir and continue cooking over medium to medium high heat for 6 minutes. Remove from heat. Delicious. I used smoked paprika… I cannot taste regular paprika no matter the brand and added more pepper and doubled tomatoes on top. Lollie, I love smoked paprika, and sweet paprika comes in a close second. I tried this for lunch today and was pleasantly surprised. I did make a couple of changes due to not having a couple of the ingredients listed. I didn’t realize when I started making it I was out of tomato sauce and puree, so I used a can of Rotel. I also omitted celery seed since I didn’t have any. My husband and son said it was very good. Also, I just left it in the skillet and sprinkled the cheese and bacon on top and it worked fine. I will add this to my recipes that get made frequently! Kathy, Thank you for trying the recipe and leaving a nice comment. Good to know the substitutions worked out. It is one of those recipes that can be changed around a bit. The celery seed (totally optional), was just me cleaning out my spice rack. I made this today, and WOW, so good! 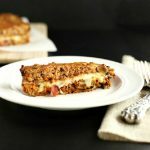 I added the cheese, which combined with the bacon is so good! Thank you! This one is a keeper for our primal eating household! I love this recipe mostly because it involves the food of the God’s – Bacon. I’m excited to give it a whirl very soon! Kelly, Oh I just love your clever wit and total cuteness! You are a force of awesomeness! !